What’s going on over there? christinakosatka on What’s going on over there? XRumerTest on What’s going on over there? A Disappointing Letter – christinakosatka on What to do with Christmas cards after the holidays? christinakosatka on Can I get some recognition here? 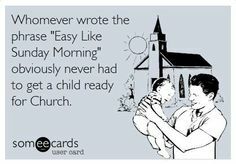 Getting the kids to church on Sundays can be difficult. Making all four kids get up, get dressed, maybe eat something, and get in the car is hard enough. But the fifteen-minute car ride to the church has begun to be the worst part. The fighting has gotten so bad we have been taking two cars to church, just to allow the children a buffer zone away from each other. Last week, however, there was a problem with the second car’s battery, forcing all six of us back into one car for the dreaded Sunday morning ride. It started right away when we all got in. The twins began shoving each other and quarreling over a toy. GG insisted Boo was sitting in her seat and felt perfectly justified in sitting ON her sister and buckling the seat belt around herself while Boo screamed that she was being crushed. I started hollering directions from the drivers’ seat: “GG! Get off your sister! Boo! Stop that noise! Little Boy! Give that back!” My husband knocked on the window. “Let me drive,” he said, in his I’m-the-reasonable-adult-voice. I got out in a huff, annoyed that he was implying he was better able to drive calmly with all the chaos going around behind us. The kids finally settled in their separate seats but continued to quarrel and snipe at each other. I sat angrily in the passenger seat and watched my husband placidly buckle his seat belt and start the car. He seemed to be humming a little tune to himself as he drove the van out of the garage and down the street. Obviously he was out to prove he was the better parent, I thought. He was trying to show that I was the screaming-shrew mom and he was the calm-and-cool dad. I seethed. Then I noticed something stuffed in his ear. I peered closer. He glanced over at me. “What?” he said. FEATURE #1. This route ain’t gonna fly, cowboy. Give it up. Or “Recalculating. Make a right. Make a right. Make a right.” ACK! I just went in a circle! Stop trying to force me to take that road, electronic voice!! FEATURE #2. This road is dead to me. Sometimes there are roads I hate permanently. I don’t want to go on them if I can help it. EVER. So at least I’d know it TRIED to avoid the hated route. You know? FEATURE #3. Can I get a little sympathy here? I really hate it when I keep missing turns or whatever and the electronic lady starts to sound both annoyed and patronizing. I mean, I know that all she really says is, “Recalculating,” but she has a TONE. I definitely think these buttons would enhance my experience with the GPS. Don’t you agree? Who put out a hit on Ducky? I saw this as I was about to get into my car to drive the kids to school. The other side of the tire is against a curb, so the only way the car can go is right over this poor little yellow guy. Wow. Ducky has really made someone angry. Posted on October 29, 2013 October 25, 2013 Categories RandomTags cars, photos16 Comments on Who put out a hit on Ducky? I was making a picture of myself driving the kids to school when my husband insisted on putting himself into the drawing. I would like for everyone to celebrate with me, as I passed a major parenting milestone this summer. EVERYONE CAN PUT ON THEIR OWN SEAT BELTS IN THE CAR NOW!!!!!!!!! This is a big deal. I have spent SEVENTEEN YEARS buckling people into car seats, kneeling on crumb-covered carpets and upholstery, handling sticky buckles and straps, maneuvering past struggling arms and legs. BUT NO MORE!!! Now I sit calmly in the driver’s seat of the van and I say cheerily, “Buckle up!” and they ACTUALLY DO IT!